There's a good deal of whining that goes on in gaming culture; often it's misguided and even more often it's ignored. In this particular case however, gamers and developers both have addressed real concerns in a mature fashion that, honestly, has left me quite impressed. 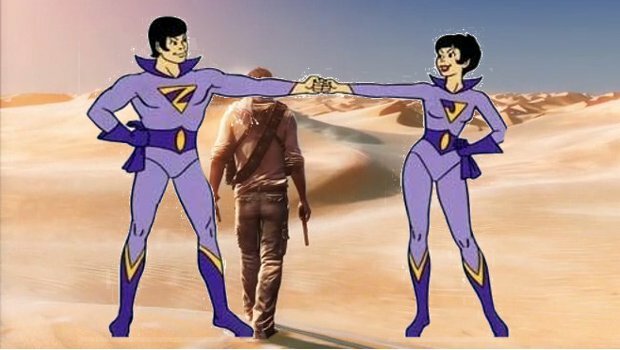 It seems there's been a bit of unrest amongst the internet-dwelling fans of the Uncharted series. A gaggle of NeoGAFfers have taken to deducing what exactly differentiates Uncharted 3's shooting mechanics from its predecessor's. GAFfer's complaining, who knew? (JOKING) The surprising bit is that they were not only well-spoken, polite, and intelligent about the matter, they were actively trying to, as Naughty Dog's Arne Meyer puts it, "dissect what was happening." So what's a company with legions of adoring (and apparently astute) fans to do with valid criticisms left politely on their doorstep? Invite those folks in to make it right, of course. Four GAF-going Uncharted fans were brought in to the studio's LA office to make their case and take part in a series of tests to pin down what was wrong and how it should be fixed. The result of this effort is an incoming patch that will give users the option to switch from UC3's current design to a more UC2-reminiscent, rebuilt mode. They've yet to set a date for the patch, but it's expected in the next few weeks. After watching a few user submitted videos of this control issue, I'm left wondering how this wasn't a bigger deal. This one in particular highlights a problem that seems to forgo any justification. With the controls' stubbornly sticking to the axes, aiming accurately would definitely be an issue. Regardless, it's being taken care of, and both parties involved were surprisingly mature about the entire matter. Good for you Naughty Dog! Yay, maturity!